A worksheet to practise choosing between the preterite and imperfect tenses to describe a past holiday. 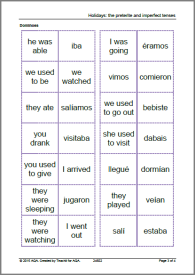 A dominoes game containing both tenses is included as a possible starter or plenary activity. Will use it soon. Thanks for sharing.